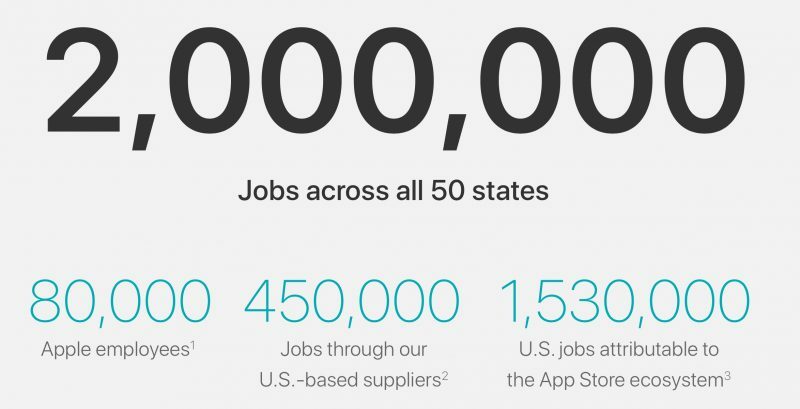 Apple updated its website on Wednesday with U.S. job creation numbers from 2016, revealing that the company has generated a total of 2 million jobs across all 50 states. Last year saw Apple spend more than $50 billion with 9,000 U.S. suppliers and manufacturers, and create around 90,000 supplier and manufacturer jobs, bringing the total number to 450,000 jobs, up from 361,000 in 2015. Meanwhile the number of people directly employed by Apple rose to 80,000, up from 76,000 in the previous year. Across the U.S., 29 cities are home to at least 250 Apple employees, while 44 states have an Apple Store. Apple says it has seen a 28x increase in employment outside of California since 2000, with a 1,500 percent growth in U.S. employees as a whole since 1998. Software-wise, Apple states that 1,530,000 U.S. jobs could be linked to the App Store ecosystem, an increase of 130,000 from 2015. U.S. developers were said to have earned $16 billion from sales since the App Store was launched in 2008. The dedicated web page also provides a state-by-state breakdown of the above figures and highlights some of Apple's major U.S. investments, including its Cupertino headquarters, data centers in North Carolina, Oregon, and Reno, and campuses in Arizona and Texas. The website changes come on the same day CEO Tim Cook announced that Apple is creating a new $1 billion fund for advanced manufacturing, in a further effort to promote U.S. job creation. I create jobs too! Tons of jobs linked to me! I **** in the toilet. The infrastructure and it runs to the wate disposal plant. I take the train to work! Throw out garbage, more jobs! What's the source for this 2M figure? Apple buys glass from Corning therefore anyone who works at Corning is a job created because of Apple? Seriously? The "statistics" on Apple's website are complete rubbish! Apple can't claim 1.53 million US jobs as their own creation. 99% of those “US jobs attributable to the App Store ecosystem” are casual/part time, self made developers struggling to make a cent. These individuals were also already coding and writing apps well before Apple came along. Apple needs to provide a full breakdown of App Store profits, and who is making the total sum of the profits. I’d argue 99% of those in the Apple Store ecosystem are making less than 1% of the profits. Complete utter rubbish. All Apple can claim is 80k direct Apple employees, that’s it. If Apple wants to talk supplier employees, then let’s get real and talk about 1 million employees at Apple’s offshore Chinese and other overseas factories. That's where the majority of Apple's employees work if we're talking about "jobs attributable" and other such nonsense. The clues to the truth is actually found in what Apple omits and does not include in the discussion. Apple lies to customers so much it’s disgraceful. The stats on Apple's website are completely flimsy and the production of an ametuer marketing team. The stats completely discredit the Apple brand, they are totally bogus. Oh please MacRumors, can you bring back the down vote option. Why would you want to downvote him anyway? I don't for a second believe 1.5 million people in the US earn their living through the App Store and the App Store alone. App Store earnings are heavily skewed to the largest and most profitable developers. Most will earn a moderate amount of pocket money at best. This is pretty blatant spin even for Apple. I'd like to see a Fact Checker take on their claim. I'm sure it would score "highly dubious" if not "blatantly false". And Apple claim they want to combat alternative facts? How about they start combatting their own? Often games are ported to iOS relatively quickly and easily because of engines like Unity. So does that mean income from those apps created those jobs and if so how does Apple estimate how many? The page contains no information on how they came up with this estimate. No doubt a very liberal and superficial approach was taken to their employment estimates, if not plucking a number out of thin air to make nice and impressive sounding 2 million figure. If this was a scholarly article it would be laughed at and thrown in the bin. The thing is, half a million jobs isn't bad at all. Pretty god-damned impressive actually. Why the need even to inflate it to 2 million? Half a million real jobs is way better than reporting 2 million of which three-quarters are indirect/maybe/possibly jobs. Then there's the nearly half a million "supplier jobs" they say they created too. I wonder how they audited that! It's beyond arrogant of Apple to say they created the jobs of these developers or suppliers. Indirectly enabled some no doubt but not created. This is marketing PR meant to lobby Washington. Nothing more. I've got an entire floor of here at work with developers creating/updating apps for iOS and tvOS. Which, to me, sounds like it's based on the amount they spend with those suppliers, so they're not just assuming that every single employee job there has been "created" by Apple. Anyone with a more economics-y background able to shed more light on this? It's fine to have a go at Apple for just making up nonsense if that's what they're actually doing, but you should at least read the information they're making available first. C'mon people — this is a perfect example of the sort of automatic knee-jerk Apple-bashing and negativity that people here complain about! You have to look beyond the obvious hyperbole and verbosity in that quote to see the actual point. To be fair, there's a lot to look beyond. :D Point being, these are the types of marketing numbers that take extreme liberties with facts. Apple's not the only company guilty of the practice (not saying that you claimed this), but others doing it too is not a valid argument for taking this "news" as anything but marketing propaganda. To read anything into these numbers is folly. If those devs were hired at the World Wide Leader for iOS/tvOS app development and that's all they do, then that is job creation attributable to Apple. A company having an app developer can't arbitrarily be attributable to Apple because that dev could have already been an employee. This is how everyone plays this game though to the point that there must be an economic principle this is based upon. Look at the fantasy numbers about job creation that came out of the stimulus bill. Same math. You just need to understand that these numbers aren't calculating direct reports. This is basic economics. If you put a certain amount of money into circulation in a local economy, those funds will support a certain number of jobs and businesses. People spend their money on food, shelter, health care, transportation... When they don't have it, they can't spend it, and others will feel the pinch. People tend to cry "foul" when employers use job creation estimates to negotiate tax credits for opening a new factory or to persuade voters to build a stadium, but those same people will cry foul over lost jobs when that factory closes or the team moves out of town. Sorry, but the numbers work in both directions. Now, one can argue, "If it wasn't Apple, it would be some other company," but each company's activities are likely to have a different localized impact. An Apple Retail Store will have its impact in one town, an Amazon Distribution Center will have its impact in a different town. If people have to leave a town to find employment, that town suffers, and when they arrive in a new town, the new town benefits. That's why they say, "All politics is local." Until people can observe the cause-and-effect they can't fully appreciate it. Sure, this whole thing is PR, but there's nothing wrong with that. Apple is perceived as a company that spends all its money overseas. Since it does not spend it all "over there," they're trying to get credit where credit is due.